The viral video is a year old and was shot when the UP CM had visited Tripura for the party’s election campaign. 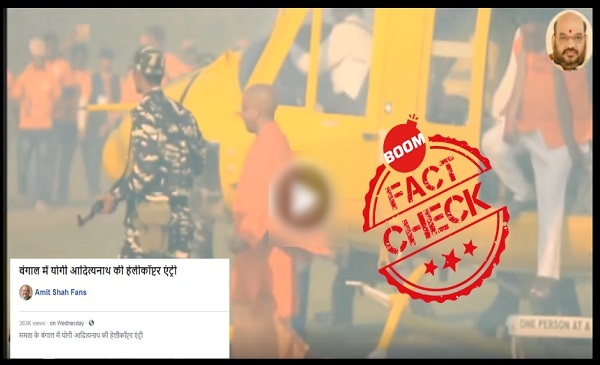 A video posted on a Facebook page ‘Amit Shah Fans’, claiming to be the footage of Yogi Adityanath’s chopper landing in West Bengal, is false. The 3.8 minute long video, where the Uttar Pradesh chief minister can be seen dismounting a yellow chopper, has gone viral. He can be seen waving at fans and then later being greeted by members of the Bharatiya Janata Party, as supporters chant Vande Mataram in the background. See the post below and the archived version here. 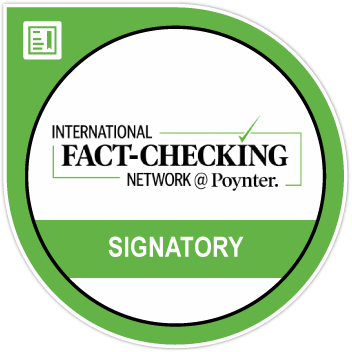 The post tries to mislead users on the claims that despite Chief Minister Mamata Banerjee’s efforts of not letting the BJP party leaders enter Bengal to hold rallies, Yogi made it. The post has been viewed more than 3.5 lakh times. The video is not related to Yogi Adityanath’s arrival in West Bengal for the consecutive rallies he had planned. The viral video is a year old and was shot when the UP CM had visited Tripura for the party’s election campaign. 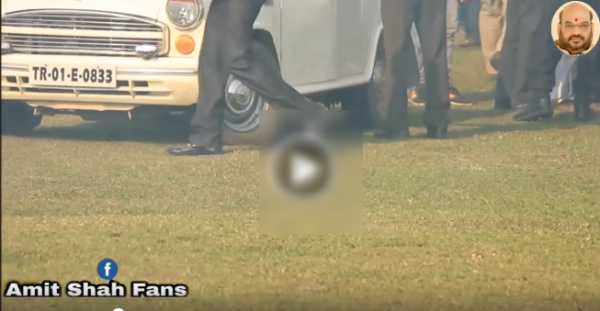 BOOM analysed the video and found out that it is originally from one of Yogi Adityanath’s Tripura rally. At 0.25 second mark, people In the background can be heard speaking in local Silchar language. Moreover, registration numbers of the cars seen in the video are that of Tripura – TR. 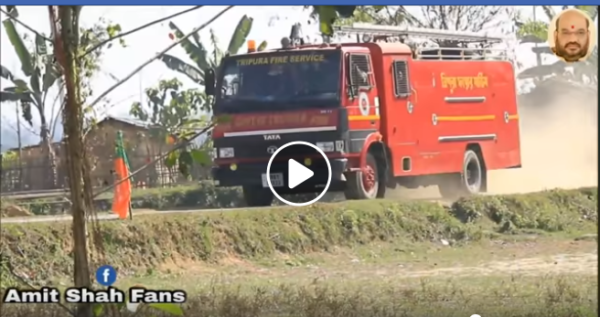 Even the pilot car states Tripura police and fire brigade van has “Tripura” written on it. Yogi Adityanath visited Tripura in February last year for campaigning during the assembly polls. He went to Dharamnagar , Kanchanpur and Jubrajnagar on February 12,2018. The video had earlier been debunked by India Today. Interestingly, Adityanath’s chopper was not granted permission to land in West Bengal by the state government. He held a rally in Purulia on February 5. The state government had not given permission to land the helicopter on the grounds due to a lack of a proper helipad at Purulia. Thus his chopper landed in Jharkhand and he reached Purulia to attend the rally, via road from Jharkhand. Meanwhile, Yogi Adityanath conducted another rally via phone. On February 3 , he was supposed to hold a rally at Raiganj but the state government did grant permission. As a result he convened a teleconference and held the rally of Raiganj. At Balurgaht too Yogi’s helicopter was not granted permission to land.